Doing laundry is one of those lovely chores that is never-ending. Especially in a large family, you can bet there is someone somewhere doing their part to fill your hamper. Finding a few tips and tricks to make this chore a bit easier to do is always on my radar. As a seasoned laundry washing vet of 30+ years, I can safely say that I now have a laundry system in place that keeps our clothes under control and also keeps this chore a bit easier to stay caught up on. Now, before we dive into our family laundry system let’s go over a few tricks to make things a bit easier for you and your family. Tip #1 Fix the sock dilemma. There is nothing more time consuming than matching up socks especially if you have more than a few kiddos at home. 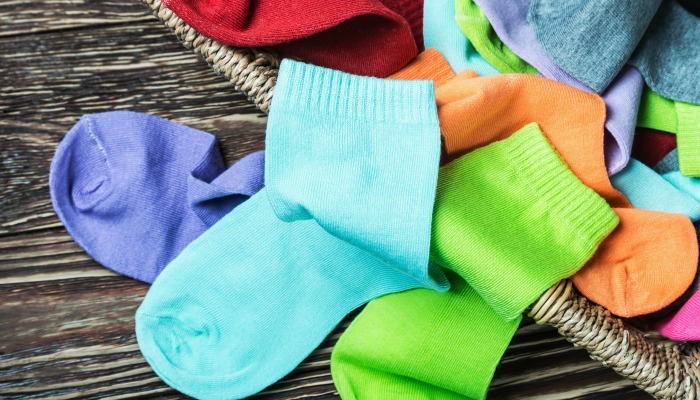 To help fix this, our kids each wear a different style or color of socks. This tip has saved me mountains of time and really cuts down on those single socks that tend to magically multiply yet never have a pair. Tip #2 One towel per week rule. If you are using a towel to dry a clean body and then hang the towel up to dry, it only makes sense that your towel is clean and not dirty. In our home towels, last a week and I only wash them weekly. This will at least keep your towel loads to a minimum. When I was younger, my mom sewed my name on my towel and this way I always knew which one was mine. Tip #3 Have a hamper in every room. This is a game changer let me tell you! Each of my boys had their own hamper and that meant they were responsible for bringing clothes down when they needed to be done. Since I do not have a set laundry day that meant they could bring their clothes down any day and that at least saved me from one battle. If you have a set laundry day you can give reminders to your family so they all know today is the day to get their clothes into the laundry room. Just a loud yell announcing it is laundry day and if they want their clothes cleaned they will need to get them down there fast! Tip #4 Wash by hamper. Unless you are washing a brand new red jersey, toss all those clothes into one load. This is the one tip that has completely overhauled our laundry system. When I wash clothes by person not only does it save time from not having to sort things, but it also saves time when I am folding as well. No more giving the wrong jeans to the wrong boy (which is earth-shattering let me tell you). If only my youngest’s clothes go into the wash I can guarantee only my youngest’s clothes are coming out. This has probably cut my laundry time in half. To keep colors from running, simply add 1/2 cup of white vinegar to your wash cycle and this will help to keep colors from running onto your whites and cut down on odors as well. Tip #5 Declutter the closet. Every season our family does a clothes purge. As we are cleaning things out of the closet and dresser the boys simply put any clothes they no longer want or fit into on the kitchen table. The rest of my kids will go through things to make sure there is nothing they want. Whatever is remaining is sent off to our local church to be sold at our rummage sale. By having less, we wash less giving the clothes we love room to breathe. This will help them to last longer as well as saving us money. 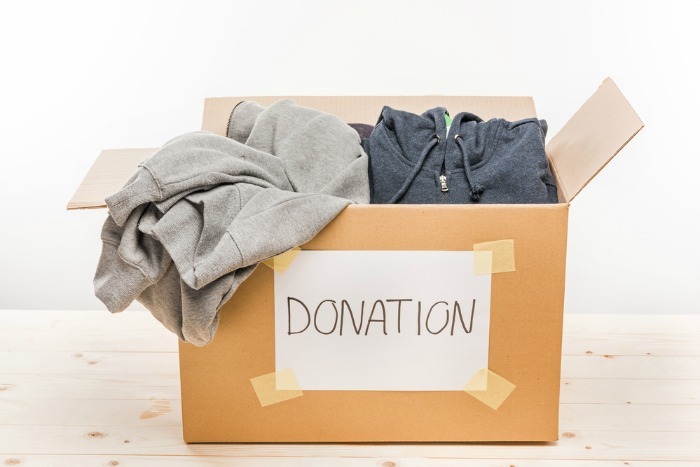 If you find it hard to let go of your clothes you can read some great tips here on how to make this chore a bit easier. How To Declutter Your closet When It’s Hard To Let Go. Tip #6 Let the family put things away. I fold all of our clothes in our basement where our laundry room is. Since I wash all clothes by person I can easily fold clothes and put them right back into that person’s hamper. Our boys simply come down grab their hamper and take them up to put away. If there are any hanging items these clothes are kept by person also so they can easily grab their clothes to take to their rooms. If your kids are younger you can deliver them in one easy step. These hampers are easy to carry and come in many sizes so they will fit the age of the child using them. Tip #7 Top priority clothes. If you have kids that play sports or wear a uniform to work, this tip will really help you out. My family knows that if they have a stained shirt or a “need it now” item it goes on top of the washer. When I do laundry I know these are the things that need my attention first. I will soak or spray any stains and wash those items first to make sure they are done on time. 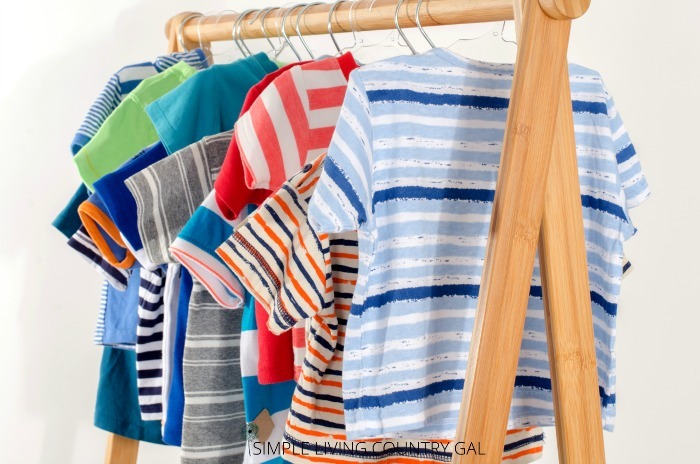 If our kids do not get “need it now” clothes on the washer and instead allow them to stay buried in their hamper, they may not get washed in time. They will have to find a plan B if they forget. Giving your kids more responsibility will not only help you but it will teach them as well. A dirty uniform will not end the world but will instead be a reminder of how they need to take responsibility for their things. 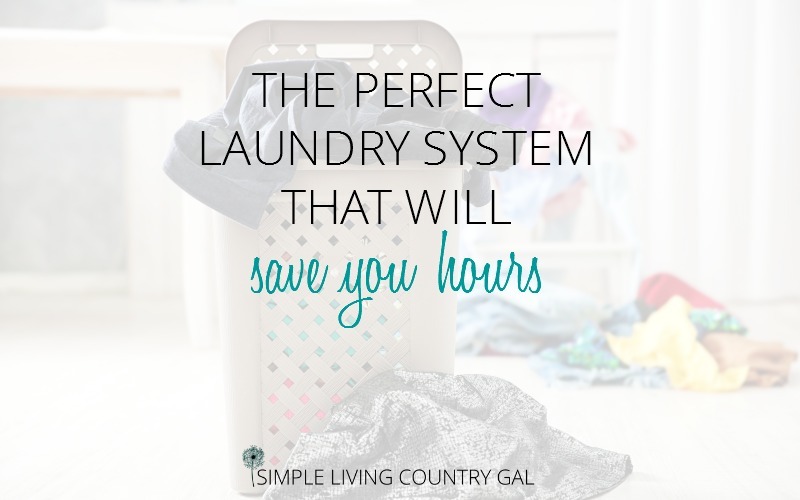 Now, that we have the time-saving tips out of the way, let’s take a peek at my laundry system and maybe give you a few helping ideas so you are not spending hours washing clothes every week. My Time Saving Laundry System. I do laundry every single day. Whether your family is small or large spreading laundry out rather than doing it all in one shot is a great way to turn a day-long chore into a few minute long tasks. Like dirty dishes, by spending a few minutes to wash what is in your sink you turn a huge job into a quick chore and save a ton of time. Let’s watch my day in action…. Every morning I will start my coffee maker and head down to our laundry room. Clean clothes are taken out of the dryer and placed on my folding table. Next step is the washer. Wet clothes are quickly sorted. Items to be hung are put into a small clothes basket and the rest is put directly into the dryer. Hanging items are hung on a drying rack or on a hanger to dry. A new load is then started from what is waiting to be washed. I will first take care of any items on my washer that may need attention. Hub’s and my clothes are always washed first. If we have a load that needs done that is first on the list. If not, I will move on to the first hamper or any towels/sheets that may need to be done. Once the washer is full and running I will move to the clothes on my folding table. Any clean clothes are now folded and put into that person’s hamper. If you are wondering, I do not carry Hubs and my hamper down to our laundry room. Since I have gotten older I have found these bags make lugging clothes so much easier. I can fit a full load of clean and folded clothes in one of these bags and once empty, fill it right back up with any of our dirty items from our hamper. Easy to carry and easy to move. Remember by having your kids bring their dirty clothes to you and then put their own clothes away you save a ton of time. Tip: if you have younger kids, use baskets in their rooms for quick put away. If they do not read yet, simply attach pictures to help them know what clothes go where. Don’t worry about good items getting wrinkled. Instead, keep those on hangars and up where they will stay neat. From start to finish this system takes me the same time it does to make a pot of coffee. Just a few minutes every morning and I am able to keep caught up on our laundry for a family of 6. Now, on the weekends I only need to do a quick load if sheets or towels and that is so much easier than doing laundry all weekend long. Finding a system for chores and tasks can really save time and energy. By breaking large things down into bite-sized pieces you can ensure you never get behind on things again. Leave a small post-it note by your coffee maker or anywhere in the kitchen to remind you to do a morning load of laundry. Before you know it, you will have a simple habit of your new laundry system added to your morning routine that will save you from spending a full day in the laundry room.